With Spring right around the corner, it is a perfect opportunity to look at our Canyonlands, Arches, and Moab Multi-Sport road bike tour. 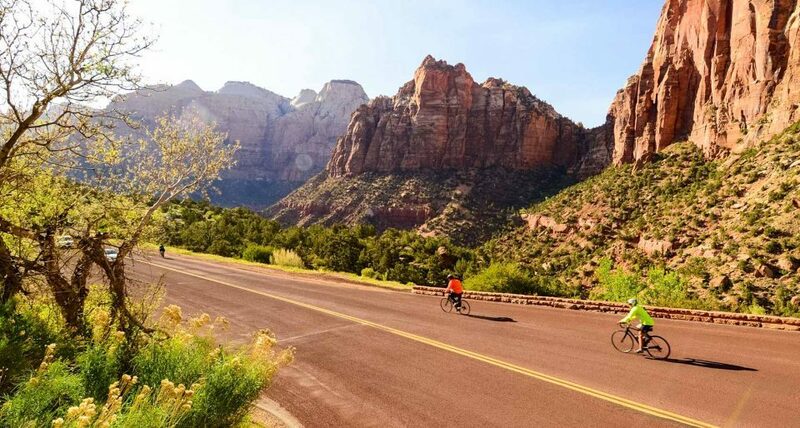 Combining biking, hiking, rock climbing, and canyoneering, this 6 day adventure is sure to please even the most seasoned explorer. Picture vibrant sandstone walls chiseled by the mighty Colorado River, lit by the evening glow of a desert sunset, and backed by a magnificent range of snow-capped mountains. In the midst of Utah’s Canyon Country, Moab’s backcountry provides the perfect setting for your multi-sport adventure. At Arches, we’ll hike through a geological wonderland, where natural exhibits of pinnacles, arches, pedestals, and balancing rocks seem to defy the laws of physics. Contrasting colors, textures, and landforms distinguish the many vegetation zones of this canyon country, each offering its own kind of adventure. At Dead Horse Point and Island In The Sky, expansive views of maze-like chasms typify our road biking experience along the acclaimed mesa. Moab’s canyon country’s vertical landscape challenges us with fantastic introductory canyoneering. And, while the Colorado River’s power is present everywhere throughout our adventure, nowhere is it better realized than on our exciting day of river rafting. Adventure seekers lacking outdoors experience, or family-groups will find this tour a perfect match of package options and tempo. The profusion of rides, coupled to wide variability of terrain makes this trip easy to customize. We can both accommodate and adapt this tour according to group-size; including seasoned riders, families, all the way to riders new to road biking. At a fitness and technical level of 1-2, this multi-sport road bike tour is a perfect option to bring along children, families, youth groups, and corporate clients. For more information, click HERE and request a detailed itinerary to be sent to you. Let Escape Adventures help you create memories for a lifetime.